We sometimes forget that before the internet and YouTube, a nostalgic whim to hear a song or watch a video clip couldn't be instantly gratified. When I was in my early teens in the 1980s, before my family even considered a cable subscription or owned a VCR, watching something on analog TV or hearing a piece of music on the radio still had a fatalistic thrill, because I never knew when it would come on again, or if I’d even have the reception for it. I'd wait for hours to hear/see it again, transfixed and shutting out the rest of the world when my patience finally paid off. The first time I saw a Duran Duran video, and caught a glimpse of their bassist John Taylor - that cute, wiry guy with the square chin, bleached bangs and grey fedora - and his fetching bandmates singer Simon LeBon, keyboardist Nick Rhodes, guitarist Andy Taylor and drummer Roger Taylor (none of the Taylors are related) - riding elephants in the hot sun and calling one night stands “paradise” - I was enthralled. And broke because I had to own everything - every record, poster, magazine, book. I had to keep seeing and hearing what the “Duran Brothers,” as my friend Liz’s dad referred to them, were up to. Now it’s easy enough to follow them on instagram, watch any of their videos on demand and access their rare B-side recordings (finding the limited edition vinyl 12” singles with the deep cuts was the 1980s equivalent of scoring a bottle of Pappy Van Winkle in a mom and pop liquor store at regular markup). I was even able to meet John Taylor at his book signing years ago, and waited in line with a cross section of fans - gay, straight, male, female, black, white, tan, brown, green, blue, pink, trans, punk, new wave, old wave, buttoned up, dressed up, dressed down - who all wanted their moment with him in an otherwise ordinary world of a midtown Barnes & Noble. A few of us in that crowd had something else in common - we share a birthday with JT. And it’s today. So as a little gift to myself, and for John Taylor (fully aware he no longer imbibes), and for all you Durannies out there ahead of their 40th anniversary as a band (minus one of the Taylors who left a few years ago to spend more time with his crunchy guitar riffs), I am making good on a proposal Jason Bylan, my brother-once-removed, made to me last fall: to create a list of Duran Duran-inspired cocktails. Many of the drink names are his. For this project, I had help from some of my favorite bartenders, who were all cherry ice cream smiles when I assigned them the task of creating cocktails based on specific songs and lyrics. And yes, they’ll taste as impressive as how Nick, Simon, John and Roger have aged. To drink to the band's debut single, Donahue suggests sipping this cocktail through a biodegradable or reusable straw. Shake lightly (whip shake) to incorporate ingredients. Strain over ice into a lowball glass. Sip through eco-friendly straw. From Amanda: Shake all ingredients with ice until well chilled. Strain into a chilled coupe glass. Sense the rhythm humming in a frenzy all the way down your spine. Night Version: Sub the Campari with Cynar and serve long with a splash of soda. “Taylor made - nice and fat - like the John Taylor and Roger Taylor rhythm section, with a little bit of masculine eyeliner and lipstick.” - Joe Heron. Stir all ingredients with ice until well chilled, Pour into a chilled coupe or lowball glass. Garnish with brandied cherry. Let nightfall cover you. Based on “A View To a Kill"
Stir all ingredients with ice until well chilled. Strain into a chilled coupe glass. Garnish with a flambeaux orange peel. Pete Vasconcellos, on the drink: “This is a dry and tropical breakfast tiki drink inspired by ‘Save a Prayer,’ perfect for morning sipping. It's a deconstructed Irish coffee that's distinctly un-Irish, with everything I like about breakfast: coffee, coconut milk and a hint of sweetness. Mesh & Bone Arraku is a Sri Lankan liqueur made from coconut flower nectar - a nod to the setting for the epic music video (but Batavia Arrack, more widely available, would work just as well)." In a shaker, lightly muddle the mint. Add all other ingredients, and fill with ice. Shake well and strain into an Old Fashioned glass filled with crushed ice. Top with additional crushed ice and garnish with a mint sprig. Explains Derfler: "The first verse of 'Last Chance on the Subway' talks about the waves in a woman's hair, and the sun reflecting in her eyes, so I was inspired to create something summery and, though I hate to use this word, ‘crushable.’ The members of Duran Duran famously got started while working at Birmingham’s Rum Runner club, so I wanted to create a rum drink. The classic Jungle Bird was an inspiration." Combine rum, Italicus and lemon juice in a shaker with ice. Shake vigorously and strain into an Old Fashioned glass filled with fresh ice. Top with blood orange soda and garnish with blood orange and thyme. To be prepared in a metal thermos, preferably in the back of a car. Chill thermos with ice. Add all ingredients. Swirl. Sit beside someone new and charming and let the dewdrops glisten fresh on the side… of the thermos. Place all ingredients except Chartreuse in shaker tin with ice. Shake & fine-strain into coupe glass. Drop the 2 drops of Chartreuse onto the top. Express grapefruit peel over the top and discard. Garnish with flower & serve. The story behind the cocktail and what's this wacky tune about? : "There are many theories about the meaning behind this song. For this cocktail, I chose to focus on the theory that they were talking about gaining confidence*, so I have made a gin-based cocktail to illustrate how so many consumers have branched out beyond neutral spirits-based cocktails to base spirits with all sorts of additional flavors. I wanted to keep to a drink with just 3 ingredients for the three lines in the chorus repeated so many times throughout the song, but just like Duran Duran, there seems to be a surprising additional ingredient (the bitters). The only question mark would be whether to order a 3rd one. The brightly colored flower represents the vibrant colors Duran Duran was wearing in 1984 when this song quickly soared to number 1 after it launched. *(Other possibilities include that it was about taking drugs, or pleasuring yourself.)" Based on "New Moon On Monday"
2.5 oz dry Champagne or other sparkling wine well chilled. Combine first 5 ingredients in a cocktail shaker with plenty of ice. Shake vigorously to aerate, chill and, dilute. Double strain into a chilled Nick and Nora glass to remove any ice shards. Serve the sparkling wine in a crystal cordial glass on the side. It’s up to the imbiber to either add the bubbles to the drink or enjoy them on the side. 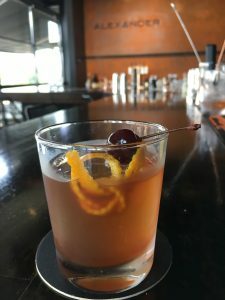 Teague explains the cocktail: "Duran Duran had a massive impact on the music scene right during my formative years. 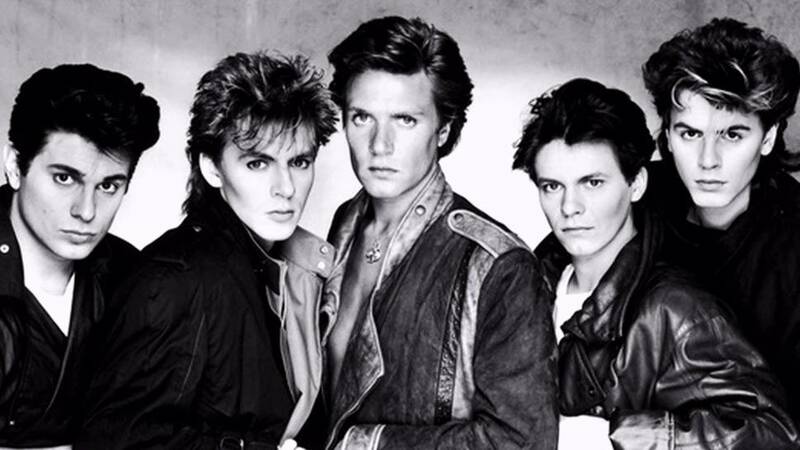 If you had ears, you were listening to Duran Duran at some point in your daily routine no matter what you did. This cocktail is a sour with a few augmentations. Orange juice is often disappointingly flabby so, the addition of apple cider vinegar helps to improve its acidity. The Montenegro adds a complexity of bittersweet flavors and a silky texture is formed when blended with juice. The backbone of this cocktail is the malty style of this gin. The cordial glass of Champagne is the lonely satellite that revolves around the cocktail. It can also be held high in toast as if though it were a torch to inspire a fire dance through the night." By Erick Castro of Simple Serve, Inc. Shake all ingredients with ice. Strain into a chilled coupe glass. Garnish with lemon twist. Repeat 6 more times (optional). Where Is All You Angels? Those thirsty angels stole a double share of the whisky used as this cocktail's base - first the bourbon in the barrels used to age it, then the whisky as it aged in those barrels. Shake all ingredients with ice. Strain into a highball glass or julep cup filled with crushed ice. Top with whipped cream. Muddle strawberries and mint in shaker. Add all remaining ingredients and ice. Shake. Double strain into chilled coupe glass. Garnish with mint sprig.